Both the Liberal and Conservative media are flabbergasted by President Trump’s decision to cut a deal with Democrat leadership in the budget negotiations. Republican leaders McConnell and Ryan are reportedly furious by the move. 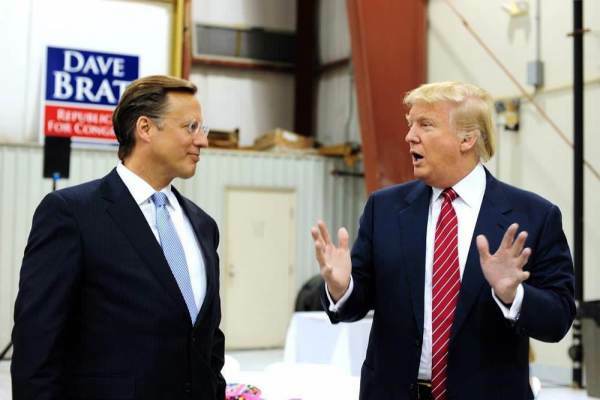 Freedom Caucus member Rep. Dave Brat of Virginia has a theory about the President’s decision. It’s all about striking back at the swamp. It was reported Thursday that Trump and Senate Minority Leader Chuck Schumer had reached a “gentleman’s agreement” to repeal the debt ceiling. Trump also agreed to sign a package of hurricane relief, a debt ceiling increase, and a government funding bill. “The swamp is in full control as far as we’re all concerned,” Brat said. Brat said he didn’t fully fault Trump for reaching out to deal with Democrats considering Republicans repeatedly promised to repeal Obamacare and yet failed to do so when they had full control of the government. Trump met with Congressional leaders Wednesday morning in the White House. President Trump shocked Republican leaders with the announcement. Republicans in Congress have been unable to keep campaign promises and pass legislation this year to help working Americans. President Donald Trump on Wednesday defied Republican leaders and agreed to Democrats’ demands to raise the debt limit and fund the government for three months, setting up a brutal year-end fiscal cliff. During a meeting with congressional leaders at the White House, Trump surprised his GOP colleagues when he granted Democrats’ request that Republicans pass a Hurricane Harvey relief package with a three-month debt increase. Top White House officials and GOP leaders had spent the past few days urging Republicans to raise the debt ceiling through the 2018 midterm election.